Fall planting in Northern Zones: Good idea, or Not? Is fall planting of perennials, or trees and shrubs a good idea? 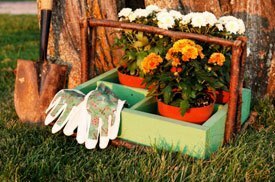 Plants that are grown in containers are easy to get in the ground at any time of year, and discounted prices make it very tempting to buy and plant in the fall. But just because plants are cheaper in the fall, is it really a good time to plant? For gardeners in northern areas where the last frost comes in May and the first frost in September, fall planting might not be such a good idea for some plants, particularly trees and shrubs..
Bulb lilies (Lilium species) – all lilies from bulbs do well with fall planting, but may also be planted in spring. However, if your garden is plagued by bulb-eating voles, spring planting is often more successful. There are many opinions, but little research has been done on the ideal planting time for trees. However, the transplant and re-establishment process is usually the most stressful event in the life of any tree because transplanting is a shock and destroys small roots. If the fall transplant is followed by the usual winter insults of sun-scald, high winds, alternating freeze/thaw, road salt spray, ice storms, heavy snow loads, frost heave, to say nothing of predation by hungry deer and rodents, fall is not an ideal transplant time. 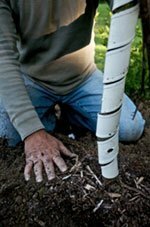 Newly planted evergreens have the additional hardship of having to draw enough water to support a full head of foliage when the soil is cold and roots are not yet established enough to work efficiently. Even though you may be tempted by sale prices, don’t plant or divide ornamental grasses in the fall. They have expended their stored energy by late summer and are not able to grow new roots if planted in the autumn. The most important thing is that you loosen the roots so that they can make good contact with garden soil, and that you keep them well watered for several weeks afterwards. If you are dividing and replanting in the fall, you should have the job done by the end of September. Whatever the season, every newly planted tree, shrub, ornamental grass, or perennial is dependent on you for after-care while it establishes in your garden. The key to success is good soil preparation, regular watering, and fertilization. In the fall, a layer of mulch will give added insulation and protection from winter’s freeze and thaw cycles. 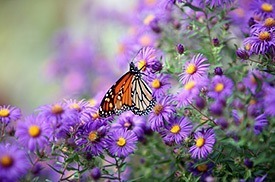 When fall planting, good care will make the difference between a plant that thrives or merely survives.